by Chris Woodford. Last updated: July 28, 2018. Wouldn't it be great if we could control individual atoms? Just imagine if we could "turn" them on and off to store bits of information, make them light up with different colors, or control them in all kinds of other ways. Unfortunately, that's not possible—but scientists have discovered how to do the next best thing with quantum dots, which are sometimes known as "artificial atoms." Simply speaking, they're examples of nanotechnology: groups of atoms made from semiconductor materials that promise to revolutionize everything from home lights and computer displays to solar cells and biological warfare detectors. What are they and how do they work? Let's take a closer look! Photo: Unlike technologies such as LEDs and LCDs, quantum dots can easily make light of any color. A quantum dot gets its name because it's a tiny speck of matter so small that it's effectively concentrated into a single point (in other words, it's zero-dimensional). As a result, the particles inside it that carry electricity (electrons and holes, which are places that are missing electrons) are trapped ("constrained") and have well-defined energy levels according to the laws of quantum theory (think rungs on a ladder), a bit like individual atoms. Tiny really does mean tiny: quantum dots are crystals a few nanometers wide, so they're typically a few dozen atoms across and contain anything from perhaps a hundred to a few thousand atoms. They're made from a semiconductor such as silicon (a material that's neither really a conductor nor an insulator, but can be chemically treated so it behaves like either). And although they're crystals, they behave more like individual atoms—hence the nickname artificial atoms. Quantum dots can be precisely controlled to do all kinds of useful things. School-level physics tells us that if you give an atom energy, you can "excite" it: you can boost an electron inside it to a higher energy level. When the electron returns to a lower level, the atom emits a photon of light with the same energy that the atom originally absorbed. The color (wavelength and frequency) of light an atom emits depends on what the atom is; iron looks green when you excite its atoms by holding them in a hot flame, while sodium looks yellow, and that's because of the way their energy levels are arranged. The rule is that different atoms give out different colors of light. All this is possible because the energy levels in atoms have set values; in other words, they are quantized. Artwork: How atoms make light. After absorbing energy (1), an electron inside an atom is promoted to a higher energy level further from the nucleus (2). When it returns, the energy is given out as a photon of light (3). The color of the light depends on the energy levels and varies from one atom to another. Quantum dots produce light in a similar way because the electrons and holes constrained inside them give them similarly discrete, quantized energy levels. However, the energy levels are governed by the size of the dot rather than the substance from which it's made. Quantum dots do the same trick—they also have quantized energy levels—but dots made from the same material (say, silicon) will give out different colors of light depending on how big they are. The biggest quantum dots produce the longest wavelengths (and lowest frequencies), while the smallest dots make shorter wavelengths (and higher frequencies); in practice, that means big dots make red light and small dots make blue, with intermediate-sized dots producing green light (and the familiar spectrum of other colors too). The explanation for this is (fairly) simple. 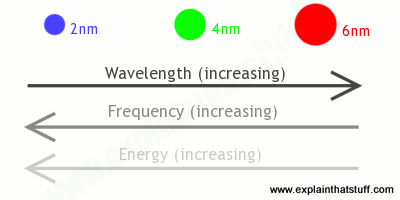 A small dot has a bigger band gap (crudely speaking, that's the minimum energy it takes to free electrons so they'll carry electricity through a material), so it takes more energy to excite it; because the frequency of emitted light is proportional to the energy, smaller dots with higher energy produce higher frequencies (and shorter wavelengths). Larger dots have more (and more closely) spaced energy levels, so they give out lower frequencies (and longer wavelengths). Artwork: Quantum dots are just a few nanometers (nm) wide. 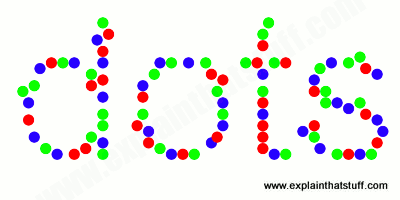 Bigger dots produce longer wavelengths, lower frequencies, and redder light; smaller dots produce shorter wavelengths, higher frequencies, and bluer light. How do you make a quantum dot? Quantum dots are precise crystals, so you make them in much the same way you'd make any other precise semiconductors crystals. Typical methods include molecular beam epitaxy (MBE, in which beams of atoms are fired at a "base" or substrate so a single crystal slowly builds up), ion implantation (where ions are accelerated electrically and fired at a substrate), and X-ray lithography (a kind of atomic-scale engraving process using X rays). Some recent research has been looking into making quantum dots using biological processes, for example, by feeding metals to enzymes. What can you use quantum dots for? So far, quantum dots have attracted most interest because of their interesting optical properties: they're being used for all sorts of applications where precise control of colored light is important. In one simple and relatively trivial application, a thin filter made of quantum dots has been developed so it can be fitted on top of a fluorescent or LED lamp and convert its light from a blueish color to a warmer, redder, more attractive shade similar to the light produced by old-fashioned incandescent lamps. Quantum dots can also be used instead of pigments and dyes. Embedded in other materials, they absorb incoming light of one color and give out light of an entirely different color; they're brighter and more controllable than organic dyes (artificial dyes made from synthetic chemicals). Still in the world of optics, quantum dots are being hailed as a breakthrough technology in the development of more efficient solar cells. In a traditional solar cell, photons of sunlight knock electrons out of a semiconductor into a circuit, making useful electric power, but the efficiency of the process is quite low. Quantum dots produce more electrons (or holes) for each photon that strikes them, potentially offering a boost in efficiency of perhaps 10 percent over conventional semiconductors. CCDs (charge-coupled devices) and CMOS sensors, which are the image-detecting chips in such things as digital cameras and webcams, work in a similar way to solar cells, by converting incoming light into patterns of electrical signals; efficient quantum dots could be used to make smaller and more efficient image sensors for applications where conventional devices are too big and clumsy. Quantum dots are also finding their way into computer screens and displays, where they offer three important advantages. First, in a typical LCD (liquid crystal display screen), the image you see is made by tiny combinations of red, blue, and green crystals (effectively color filters that switch on and off under electronic control) that are illuminated from behind by a very bright backlight. Quantum dots can be tuned to give off light of any color, so the colors of a quantum dot display are likely to be much more realistic. Second, quantum dots produce light themselves so they need no backlight, making them much more energy efficient (an important consideration in portable devices such as cellphones where battery life is very important). Third, quantum dots are much smaller than liquid crystals so they'd give a much higher-resolution image. Quantum dots are also brighter than a rival technology known as organic LEDs (OLEDs) and could potentially make OLED displays obsolete. Artwork: Quantum dot TV: quantum dots can be used to make the red, green, and blue pixels in TV screens with brighter and more precise colors than in traditional LCDs or rival technologies such as OLEDs. Computers get faster and smaller every year, but a time will come when the physical limits of materials prevent them advancing any further, unless we develop entirely different technologies. One possibility would be to store and transmit information with light instead of electrons—a technology broadly known as photonics. Optical computers could use quantum dots in much the same way that electronic computers use transistors (electronic switching devices)—as the basic components in memory chips and logic gates. Optical computers may or may not take off, depending on how much progress computer scientists make with rival technologies, including quantum computers. In a quantum computer, bits (binary digits) are stored not by transistors but by individual atoms, ions, electrons, or photons linked together ("entangled") and acting as quantum bits called qubits. These quantum-scale "switches" can store multiple values simultaneously and work on different problems in parallel. Individual atoms and so on are hard to control in this way, but quantum dots (on a considerably larger scale) would be much easier to work with. Quantum dots are also finding important medical applications, including potential cancer treatments. 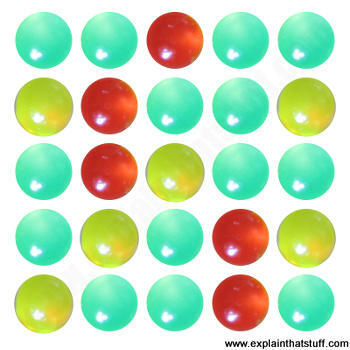 Dots can be designed so they accumulate in particular parts of the body and then deliver anti-cancer drugs bound to them. Their big advantage is that they can be targeted at single organs, such as the liver, much more precisely than conventional drugs, so reducing the unpleasant side effects that are characteristic of untargeted, traditional chemotherapy. Quantum dots are also being used in place of organic dyes in biological research; for example, they can be used like nanoscopic light bulbs to light up and color specific cells that need to be studied under a microscope. They're also being tested as sensors for chemical and biological warfare agents such as anthrax. Unlike organic dyes, which operate over a limited range of colors and degrade relatively quickly, quantum dyes are very bright, can be made to produce any color of visible light, and theoretically last indefinitely (they are said to be photostable). Quantum dots were discovered in solids (glass crystals) in 1980 by Russian physicist Alexei Ekimov while working at the Vavilov State Optical Institute. In late 1982, American chemist Louis E. Brus, then working at Bell Laboratories (and now a professor at Columbia University), discovered the same phenomenon in colloidal solutions (where small particles of one substance are dispersed throughout another; milk is a familiar example). He discovered that the wavelength of light emitted or absorbed by a quantum dot changed over a period of days as the crystal grew, and concluded that the confinement of electrons was giving the particle quantum properties. These two scientists shared the Optical Society of America's 2006 R.W. Wood Prize for their pioneering work. The Quantised World: Excellent overview of quantum theory from the Nobel Prize website. Mr Tompkins in Paperback by George Gamow. Cambridge University Press, 1993. What would happen if everyday life worked according to quantum theory's predictions? A good primer for adults and science-minded students aged 16+. Six Easy Pieces by Richard Feynman. Basic Books, 2011. There's a short introduction to the quantum world in chapter 6. Hacking Matter: Levitating Chairs, Quantum Mirages, and the Infinite Weirdness of Programmable Atoms by Wil McCarthy. Basic Books, 2004. A very readable, popular-science style introduction to quantum dot technology and its applications. Your Guide to Television's Quantum-Dot Future by Zhongsheng Luo, Jesse Manders and Jeff Yurek. IEEE Spectrum, February 22, 2018. The Cancer Surgeon's Latest Tool: Quantum Dots by Imad Naasani. IEEE Spectrum, September 21, 2016. How a Mysterious Bacteria Almost Gave You a Better TV by Joanna Klein. The New York Times, May 5, 2016. 2-D Materials Produce Optically Active Quantum Dots for First Time by Dexter Johnson. IEEE Spectrum, May 5, 2015. Will Quantum Dots Dominate Displays? by Alfred Poor. IEEE Spectrum, August 22, 2014. 'Quantum dots' to boost performance of mobile cameras: BBC News, March 22, 2010. New Genre Of Sugar-Coated 'Quantum Dots' For Drug Delivery: ScienceDaily, March 9, 2009. Carbon-Based Quantum Dots Could Mean Greener Safer Technology In Medicine And Biology: Space Daily, May 30, 2006. The Invention of the Quantum Dot: Louis E. Brus discusses how he discovered quantum dots in colloids in the early 1980s, and why he had no idea of their wide-ranging industrial applications. A Demonstration of Quantum Dots by Samsung, 2016. Watch quantum dots in action in this short lab demo. US Patent 20080172197A1: Method of manufacturing a quantum dot optical component and backlight unit having the quantum dot optical component by Mun-Ki Sim et al, Samsung, May 16, 2017. A detailed description of a quantum-dot display backlit by LEDs. US Patent 20080172197A1: Single laser multi-color projection display with quantum dot screen by Andrew Skipor et al, Motorola/Samsung, July 17, 2008. The workings of a quantum dot display, activated by a scanning laser. US Patent 6281519B1: Quantum semiconductor memory device including quantum dots by Yoshihiro Sugiyama, Fujitsu Ltd, August 28, 2001. The workings of a quantum-dot memory—and details of how to make it. US Patent 6177684B1: Quantum semiconductor device having a quantum dot structure by Yoshihiro Sugiyama, Fujitsu Ltd, January 23, 2001. Outlines the basics of a quantum dot semiconductor.